The Battle of Monocacy, known as “The Battle That Saved Washington”, took place on July 9, 1864 as part of the third and final Confederate campaign into Maryland. 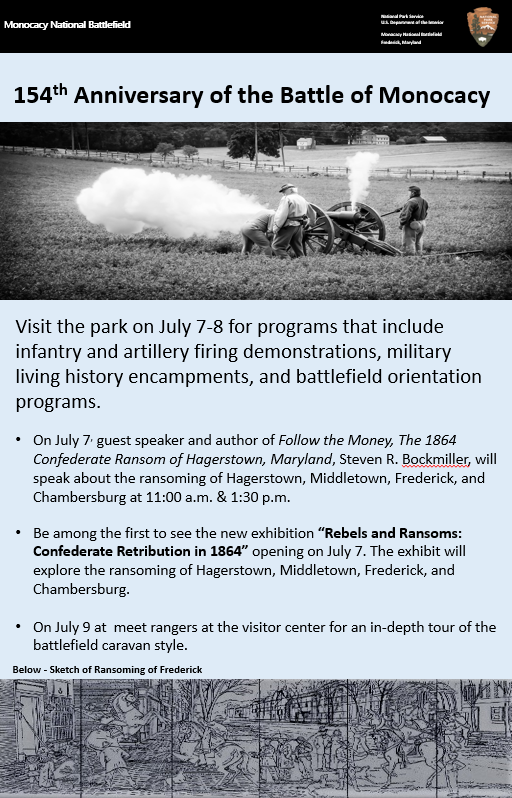 July 7-9, 2018, Monocacy National Battlefield will commemorate the 154th Anniversary of the Battle of Monocacy with a FREE special event, museum exhibit opening, and Ranger-led auto tour. Visit the park on July 7-8 for programs that include infantry and artillery firing demonstrations, military living history encampments, and battlefield orientation programs. On July 7, guest speaker and author of Follow the Money, The 1864 Confederate Ransom of Hagerstown, Maryland, Steven R. Bockmiller will speak on the ransoming of Hagerstown, Middletown, Frederick, and Chambersburg. Also, be among the first to see the new exhibition “Rebels and Ransoms: Confederate Retribution in 1864” opening on July 7. The exhibit will explore the ransoming of Hagerstown, Middletown, Frederick, and Chambersburg. On Monday, July 9 at 9:00 a.m. meet a ranger at the Visitor Center for an in-depth tour of the battlefield in a caravan style tour. All programs and activities will take place at the Monocacy National Battlefield Visitor Center: 5201 Urbana Pike, Frederick, MD 21704 (GPS address only). Battlefield Orientation Talks: 9:30 a.m., 11:30 a.m., & 2:30 p.m. Artillery Firing Demonstrations: 10:30 a.m., 1:00 p.m., & 3:30 p.m. Follow the Money: Confederate Ransoms in 1864 program 11:00 a.m. & 1:30 p.m.